Cliff Kauffman looked ready for Thunder in the Valley as he touted the work of Goodwill of the Southern Alleghenies. 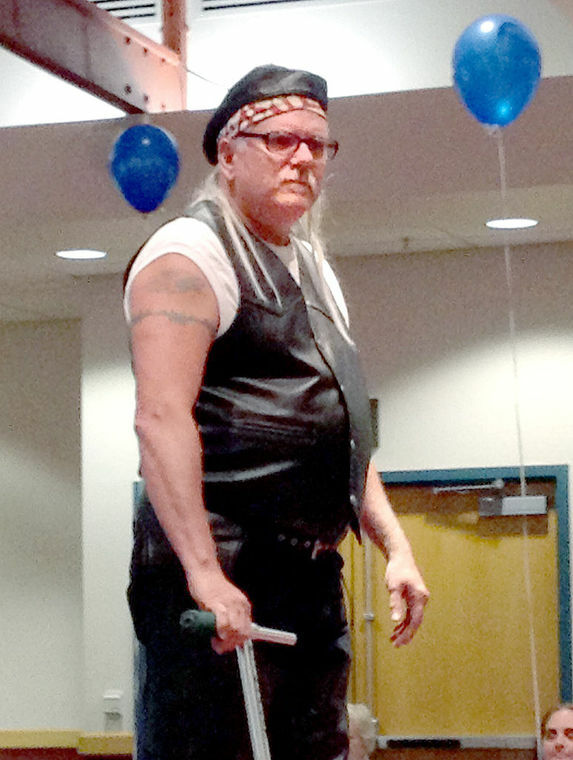 Cliff Kauffman, director of retail for Goodwill of the Southern Alleghenies, dons biker gear for a fashion show Wednesday during Goodwill’s Report to the Community gathering at Pitt-Johnstown’s Living Learning Center. Decked out in a leather vest and bandana, Kauffman strolled the runway Wednesday evening as part of a fashion show to celebrate the items community members donate to Goodwill for resale in its stores. Employees and volunteers strutted in outfits ranging from dresses and shirt-and-tie combinations to Kauffman’s more laid-back look. Revenue from its stores supports Goodwill’s programs – which include such areas as workforce training, school-to-work transitional support, youth mentoring and job services, and programs for workers with developmental disabilities. The fashion show was part of Goodwill’s Report to the Community event held at the Pitt-Johns­town Living Learning Center. The organization also paid tribute to many individuals who have benefitted from Goodwill’s initiatives. • Karen Sellers, PA CareerLink. • Vanessa Carroll, Presbyterian Home of Greater Johnstown. • Jared Burgan, Ideal Market. • Jason Almeida, Dairy Queen. • Angela Silk, Home Instead Senior Care. • Michelle Mauro, PA CareerLink. • Patrick Flanagan, Von’s United Beverage. • Joe Pipon, Goodwill Industries. • Darla Harris, Richland Goodwill Store. • Gretchen Rauch, a May Penn Highlands Community College graduate. • Dakota Rigel, Presbyterian Home of Greater Johnstown. • Sheryl Place, mentor with Goodwill GoodGuides. • Brianna and Christopher Cashaw, Goodwill GoodGuides. In addition, Valerie Deater of The Tribune-Democrat was honored for her work as chairwoman of Goodwill’s Business Advisory Council.